Before I start this review, I have to tell you, I’ve never seen the movie nor read the book, The Maltese Falcon by Dashiell Hammett. I’ve never had a desire to. I don’t really like old timey private eye movies/stories/books. In my humble opinion, they always seemed way to melodramatic for me. Silly dialogue, characters who seem tragic for some reason or another, and mysteries that are mostly easy to solve if you are paying attention. HOWEVER, I may have to change my perceptions of these types of stories. 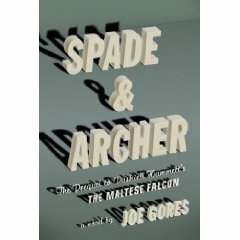 I just got finished reading Spade & Archer by Joe Gores (Knopf, February 10, 2009). This book is a prequel to The Maltese Falcon. The setting is San Francisco in the years between 1921 and 1930. There are three sections of the book and we basically get ten years of Sam Spades life tracking down a bad guy. When I first started reading Spade & Archer, I had the above mentioned prejudice against the book. About a third of the way through, I conjured up something I knew and appreciated to help me enjoy the book a bit more. You’ll never believe what I used. Captain Jean Luc Picard – the Captain of the Star Ship Enterprise from Star Trek’s The Next Generation. Why would I use that particular character? I wasn’t getting the whole Sam Spade schtick. I didn’t have background with characters such as Spade. However, Captain Picard sometimes goes to the holo-deck and immerses himself in a holo-deck novel about Dixon Hill who is a private eye from the 20s. AND…I love the episodes this happens. Dixon Hill is Sam Spade, Sam Spade is Dixon Hill. I shyly admit this association because I somewhat feel like maybe I’ve committed some sort of blasphemy to the Sam Spade character. However, as soon as I could put Picard’s face on the Sam Spade character, I began to enjoy the book! In fact, I now want a copy of The Maltese Falcon to devour. The review copy I received was brilliant. The pages are yellowed as if I picked it up in a used bookstore. The paper is reminiscent of older books – sort of thin, easily ripped, not shiny or thick. I am curious to see if this is how the book appears now that its hit the shelves. I really liked the old feel to the book – it set the tone for time period in an interesting way. The character Sam Spade evolved nicely – something I really didn’t expect. In the first part of the book (there are three), Sam doesn’t do much drinking and though he smokes, its not apparent every time he walks in the office. He’s got his demons but they don’t consume him. Part two we start to see more drinking and more smoking and some mild mistrust about Archer. Part three takes us through the final case and shows more than snippits of his mistrust with Archer. I was pleasantly surprised by the complexity of Spade throughout the years. All three parts are part of the same mystery. Sam is obsessed at catching a criminal who keeps appearing and disappearing. I don’t want to say too much more than that because I don’t want to give the mystery away. Things I didn’t like in the book had to do with the passage of time. The first part takes place over a period of four years. The story is written in such a way the four year passage of time isn’t apparent. All of a sudden, its 1925. The second part takes place over a period of three years and then the last section starts in 1928, but I have no idea when it ends, except for a vague reference by the “bad guy” about its been seven years. My issue with this is with all the years passing between Part one and Part three, how can I possibly know how long it actually took Part three to happen? Its probably not relavent really, but it bothered me. Another aspect of the book that was a bit hard to take was the doll and sweetheart references Spade would make to his secretary. I understand this is just a sign of the times and “we’ve come a long way, baby”, but its there. I caution anyone who gets annoyed with these little terms of unprofessional endearment – the book is full of these. Another area (in part two) that sort of bothered me was when a character named Penny died. Her death hit Spade very hard and well, he seemed a little broken after that. There was very little in the storyline which showed Spade had strong feelings for this girl, but his reaction to her death, suggested otherwise. I didn’t really get his reaction. As someone who has never liked this sort of story, I recommend Spade & Archer to anyone who likes detective novels, and Private Investigator stories. If you are a fan of The Maltese Falcon, I urge you to read this prequel, published almost eighty years later.